I've read a lot lately about parenting styles, well more accurately about how honest parents describe themselves in social media and the criticism from the "other side". Naughty dads, mean mummies, swearing mummies, disgruntled dads, amazing perfect dads, perfect children, Earth mothers, nice dads, honest parenting and so on. So who are honest? Really honest? They can't all be...can they? Poonami, what a wonderful word to describe something every parent has encountered. Only the other day our perfect little Bear sat as we had lunch (at home thank goodness) and the noises that came from that little body were truly horrific. We looked at each other, Grandad and I, and both got up to prepare for the inevitable. Poonami, I think it's a great word but I'm sure it's offensive to someone. Comparing a small mishap with a terrible tragedy is sure to upset someone. Well that's what I think parenting blogs and social media are like. Something that makes me laugh, makes me nod my head as I empathise with the writer, is sure to offend someone. The ones that make me think "aww, how wonderful", the perfect babies, children, mothers, fathers. Well they offend people too. My grandson, Bear, is perfect. No, honestly he is. "How can he be? No child is perfect." Well that's the point, he is because to me he is. I don't get up with him in the nights, his mummy and daddy do. I can laugh at his little tantrums, ahh bless him I cant help it. Its so cute. Have I got photo's of him having a tantrum? Of course not, I'm not fast enough with a camera. If I had one would I publish it? Probably not, not because I don't want to be negative and of course his tantrum would be done to perfection but that's not Bear, he's a perfect baby. I'm his grandmother and I write about all the perfect and wonderful things he does. I don't have to do housework whilst caring for a baby alone, or work and run a home, or get up at 6am after spending most of the night cradling a crying baby, or worry about that spot on his neck or why he cries or what is wrong with him today. I'm a grandmother. I care for him when his parents work and when he goes home I do my chores. I don't worry about that spot because that's all it is, a spot. I don't fret about why he's crying because I've had a good nights sleep and I can think rationally. But I was a mother once, who sat up all night with a child with mumps, with a child who cried for no reason. 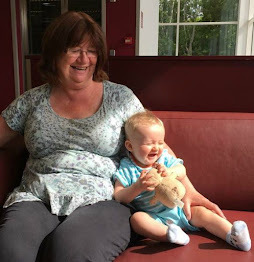 I worked full time and felt guilty that I couldn't manage work, a home and a baby. I swore under my breath when they got under my feet or when they asked for the thousandth time "why?". If blogging had been around then would I have written "honestly" about it all, of course not! When would I have had the time? Hats off to parents who blog, good or bad. When do you find the time? So who are the honest parent bloggers, twitterers, facebookers? Should we all be positive and only post happy, smiley photo's of us all having a great time? What about the bad days? Is it OK to write about them? The super parents who craft and play and have super duper sparkly houses and lives. Without them what would we aspire to? They are the Mary Berry's of parenting. Never a soggy bottom. Not because they are not honest but because that's who they are and what they do. The swearing, moaning, covered in poo and sick, tell-it-like-it-is parents. They sometimes make us laugh, or angry, or sad, or just nod in agreement. Well they're honest too. There's a place for all of us. We write this way because it's who we are. 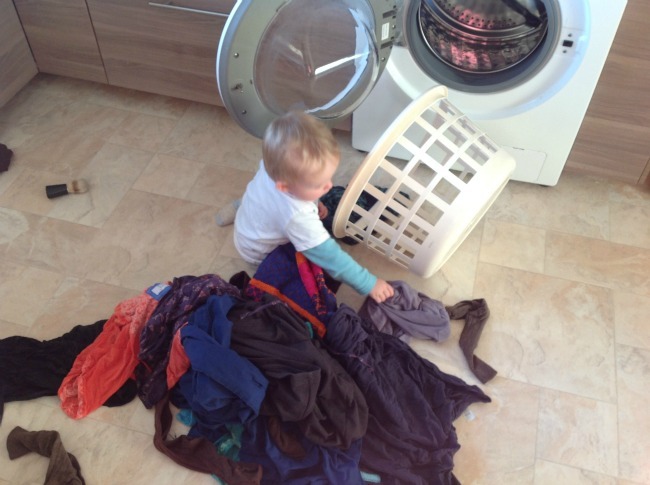 Bear helping by taking the just washed clothes out of the basket and onto the floor. Like I said perfect. I wouldn't swear in front of my dad either and I'm nearly 60! But they do make me laugh sometimes. It's so easy to relate to. The toddler always around your ankles, in the loo, throwing food that's been lovingly prepared but eating stuff from the floor! I like the nice happy ones too, makes me smile.